Glad to report that the closed sign is only for the Christmas holiday, and while not much info can be found online about the origins of the business, it appears to be family owned and operated and is a local favorite. 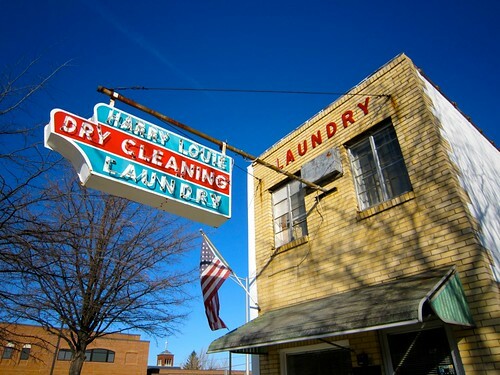 One thing that touched me about Harry Louie is that the building remains standing tall with a well maintained neon sign, despite the fact that the businesses that had flanked it years ago have been turned into parking lots. Thanks Harry Louie, for standing tall where others have fallen! 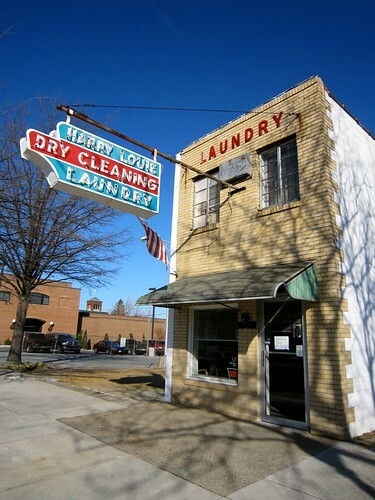 So if you’re ever in Dover DE and need some dry cleaning, stop by here to support this business, and if you’re in the area and are just stopping to photo – go on in and tell them how much you dig their sign and building. I’m sure it would make their day! I’ll remember to swing by here some evening to see if the sign gets lit up too. 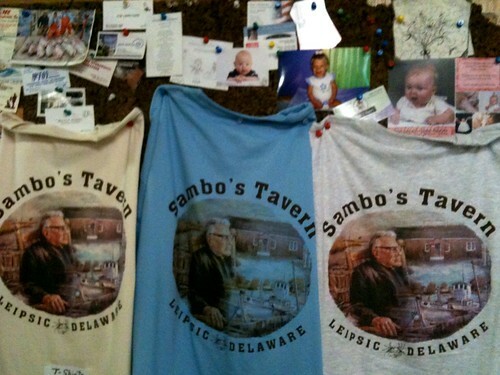 I’ve started my new year off right, and one of the best things I’ve done in these past 3 days is to FINALLY go to Sambo’s Tavern in Leipsic DE for crabs! Don’t let the fact that it’s a NASCAR fan frequented tavern scare you off, unless you have folks under 21 in your party, as it is an actual tavern (no kids allowed). 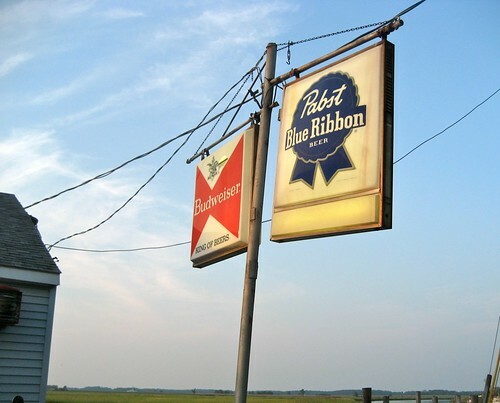 Nor should the beer signage be something to dissuade you from entering this classic waterfront establishment. 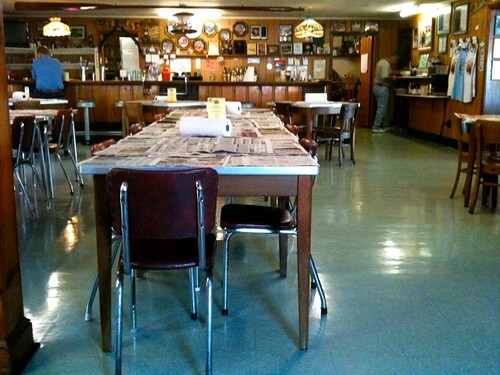 The tavern itself has been here for 55 years and when we walked in I was immediately smitten with the vintage chairs and clean linoleum floor. 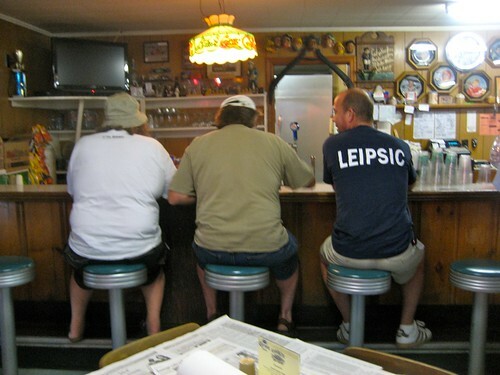 As well as the authentic bar stools and knotty pine bar decor. Now I know some people are a bit curious about the name of the tavern, so I thought I’d let you know it was founded by Samuel “Sambo” Burrows and still run by his family. I believe that’s him on the T-shirts available for sale. 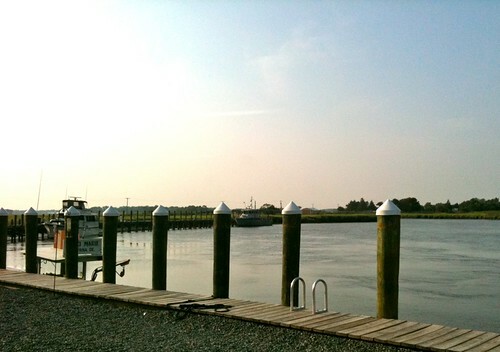 Real Delaware crabs – YUM! Nothing says summer in the mid-Atlantic like hunkering down over a tray of crabs, mallet in hand, roll of paper towels by your side, and newspaper there to mop up all the goop. Crack them claws, search for the sweet meat and just beware of the “Devils Fingers” notes my Delaware born and raised honey! 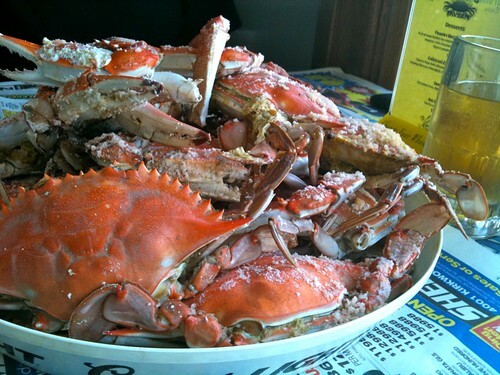 Now a couple of random things you should know- they only serve steamed crabs in season, and they aren’t caked with Old Bay but rather coarse ground salt. Good thing for a tavern owner, as the pitchers of beer we ordered helped, but if a salt-a-holic like me is telling you to make sure you brush most of the salt off, then it’s a good idea to do so. Old Bay can be asked for on the side. Speaking of sides, they were nothing special, but we were there for the crabs, as were many other folks who came in after us. And one last bit of advice- leave yourself plenty of time to devour your crabs, and don’t try to rush through them like we did. A dozen is a lot, even for a couple of crab lovers like Retro Roadhusband and me, so keep that in mind too. RetroBrotherInLaw was pleased to find we had a number of crabs left over, and considered them a fine payment for taking care of RetroRoadDog for us! 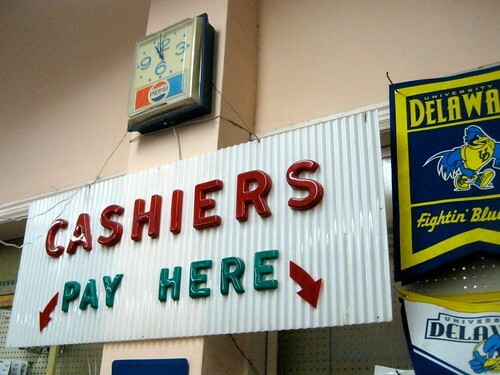 Main Street, Newark DE – 3 Cool Old Businesses Still Going Strong! I can’t tell you how delighted I was to re-visit Main Street in Newark Delaware to find 3 of my favorite old fashioned businesses still going strong. Next time you need a tasty breakfast, baked goods or random sundries from a 5 and 10, head to this stretch of road near the University of Delaware and enjoy a day on good old Main Street. Just remember it’s New-ARK, like Noah built! 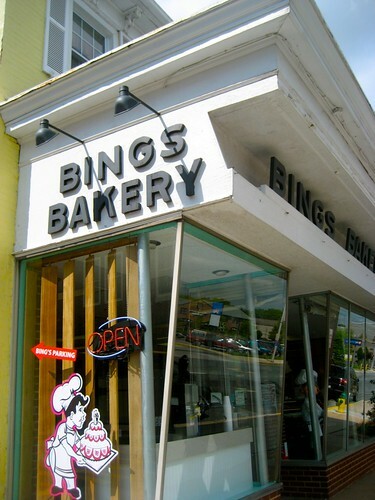 I used to work across the street from Bing’s and was always charmed by their signage and turquoise, pegboard and knotty pine interior, and was tickled to see that the new owners had not messed with this classic look. 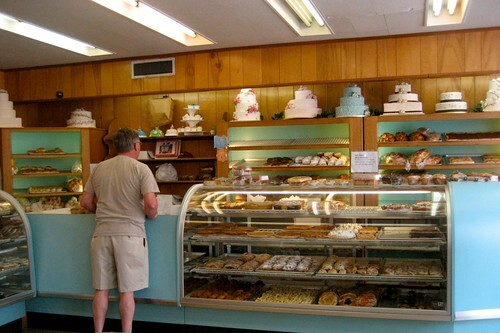 Founded in 1946 by Russell and Selina Bing, the bakery changed hands in 2005 when Selina turned the keys over to her head baker of 9 years, Tom Guzzi and his wife, Carla Guzzi. 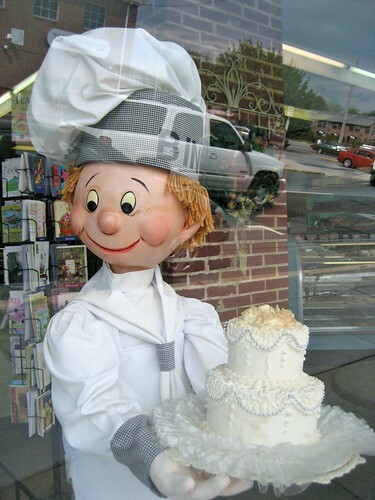 Delaware’s “longest running” bakery was abuzz with customers when I was there, from regulars picking up donuts, to a young couple discussing their wedding cake. 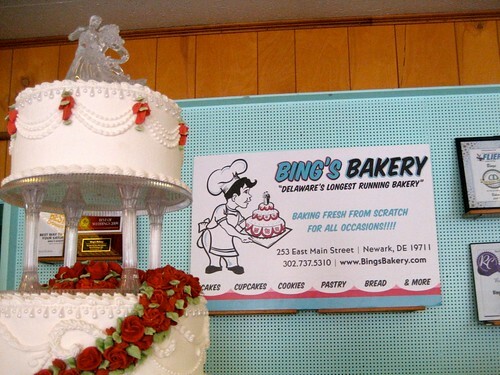 A pleasant counter gal helped me buy my bag of sunflower shaped sugar cookies, and when I asked how long the bakery had been there, a wonderfully friendly customer chimed in that her sister had been married in 1959 and got her wedding cake from Bing’s. She added that it was great that this place was still around, being one of the only bakeries left in New Castle County, and I have to agree! 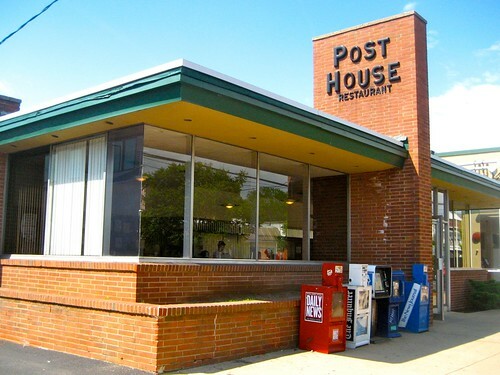 I used to love the simplicity of the Post House restaurant, with its minimalist mid century brick exterior and interior with a long countertop and burgundy banquettes for waiting. Somehow it felt more like a diner than the “real” diner on the next corner! 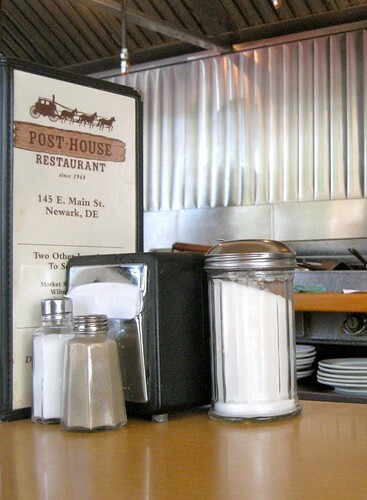 Oh how happy I was to find that Retro Roadhusband’s report that the Post House was closed was an error on his part, and this great little lunch counter was still in business! 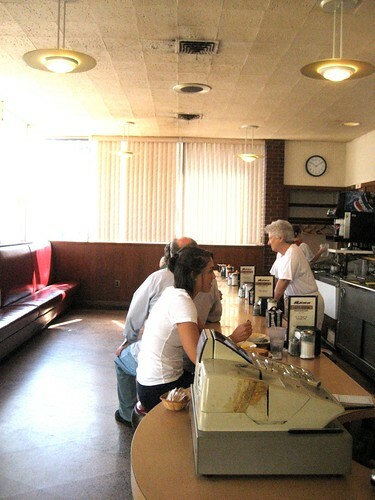 I sat myself down at the counter and ordered myself a breakfast sandwich and reveled in the fact that this place really hadn’t changed much since it opened at this location in 1956. Interesting counter story- I wasn’t necessarily eves-dropping but I could not help but hear the two gentlemen to my side discussing what I thought was a sports team- only to see when they stood up, that the Sonic they were referring to was the corporate drive in chain, as confirmed by the logo embroidered on one man’s shirt. I thought it was a sweet victory indeed that even the folks making the joy of a car hop restaurant a little bit more generic could appreciate the actual authenticity of a place like the Post House. 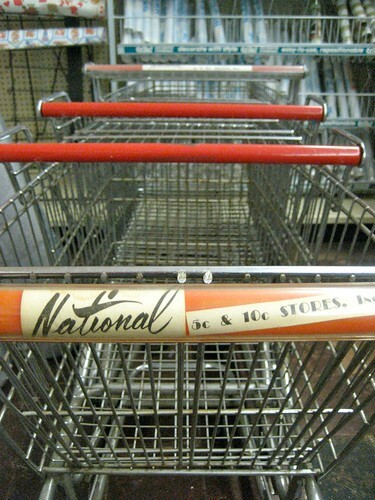 And last but not least, how could I neglect the National 5 and 10 store, with its cheery red sign and fabulous brushed stainless letters? 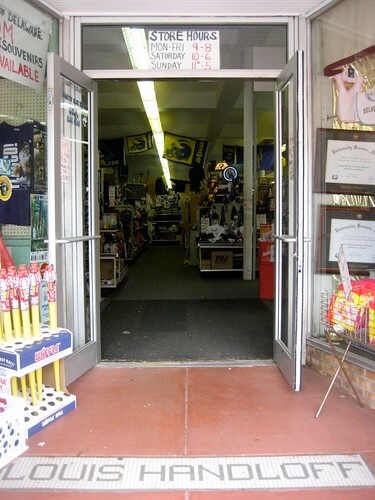 Still family owned and operated, this business has been in the Handloff family since 1911 and at this location since 1931. 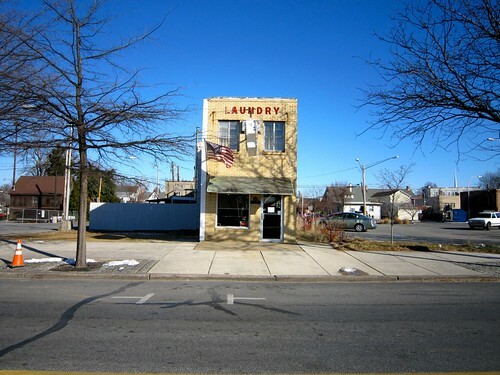 I had driven past this location scads of times but rarely ventured in, since I had little interest in purchasing something with the Delaware insignia on it. 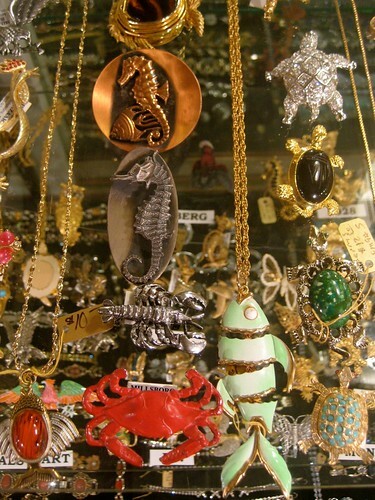 And boy, do they have plenty of Delawareabilia here at the 5 & 10, more than I’ve ever seen in my life! 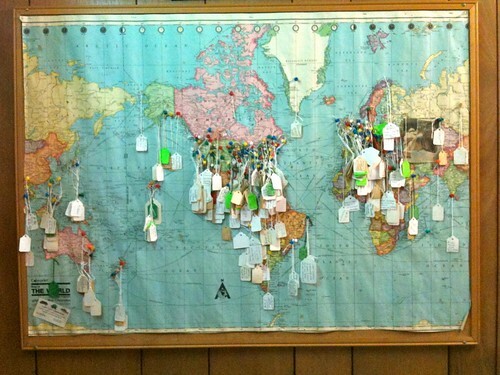 But luckily for me, they had plenty of other useful items to choose from. Towards the back half of the store it goes from college insiginia-ville to a regular Woolworth type store, with household goods, plastic toys, hardware items and keys to be cut. 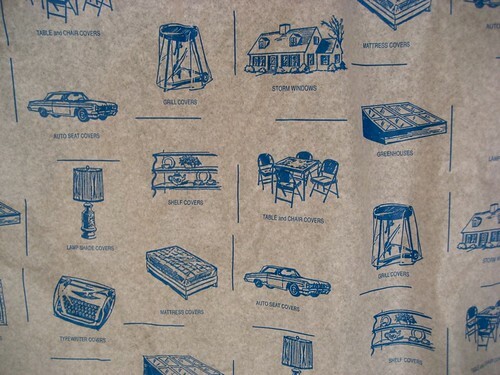 I happily purchased a couple of yards of clear plastic table covering for the Hacienda kitchen, and think I like the paper liner even more than the vinyl liner! I don’t think the young gent behind the counter shared my admiration of the cashier sign behind him, as I snapped a photo, but who knows? Maybe he’ll look at it with fresh eyes after my exclaiming how cool it was! So if you’re in the mood for some real Main Street shopping, don’t go to a faux outdoor mall that calls itself Main Street, support the real deal, on Main Street in Newark Delaware! 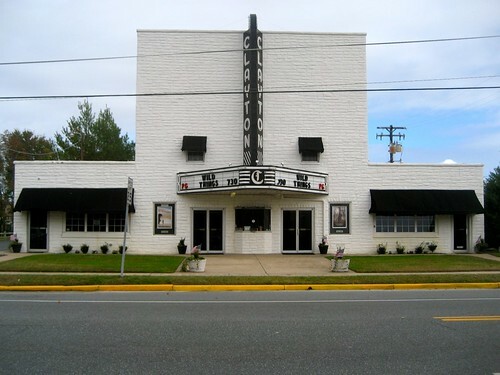 Clayton Theatre Dagsboro, DE – Celebrating 60+ Years of Movies! Joanne Howe knew that she and her husband Ed were destined to own the Clayton Theatre in Dagsboro Delaware. Not only did the movie theater share its name with Joanne’s recently deceased father, but upon entering the lobby they were met with the sight of a vintage poster for the movie “The Sands of Iwo Jima”- where her aforementioned dad fought.They purchased the moviehouse in 2001 and have been continuing the legacy of Sussex county’s only single-screen theatre ever since. Built in 1948, the Clayton is well maintained and has never had to suffer neglect through an extended closing. The theatre boasts a new paint job and carpets, and while the 315 seats are vintage (though not original to the theatre) they are surprisingly comfortable. The most striking aspect of the theatre is the towering neon marquee out front. When illuminated-for the first time in 15 years, thanks to the Howes- it acts like a beacon, luring folks from near and far like moths to the screen. Family-friendly, the features are first run and tend to show for a couple of weeks. The prices are wallet friendly too and can you believe it, snacks are in the civilized $1-3 range. Remember folks, this is typically where theatre owners make money to keep operating, so arrive hungry to help ‘em out. 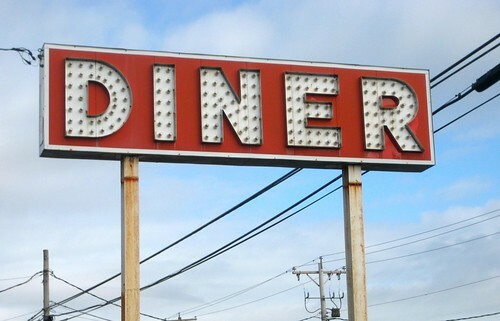 The Milford Diner has a kickin’ diner sign! Hey Larry! 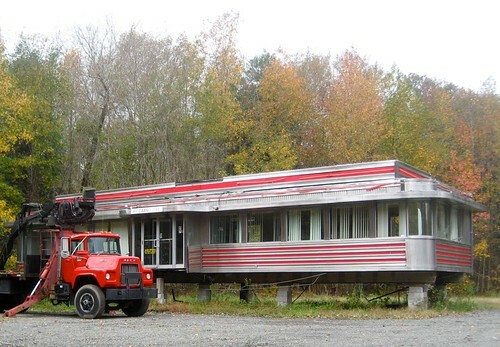 Another Abandoned Lunchonette – UPDATE!